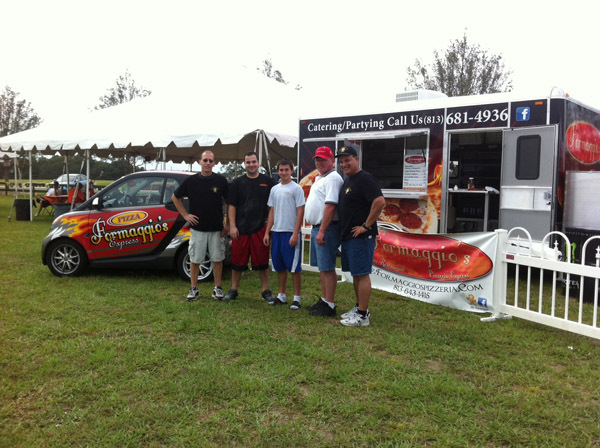 Formaggio’s, owned by Manny Tzilvelis (far right) and original founder Bill Robey (second from right) is proud to introduce its on-site pizza truck. Formaggio’s Italian Restaurant & Pizzeria, which has been open in Lithia as a pizzeria for 12 year, expanded to a dining room 7 years ago and finally, opened an express location in the Stein Mart-anchored Lithia Crossings plaza nearly one year ago. In its newest expansion, Formaggio’s has added a food truck, which can be rented for parties and has made appearances at local events, such as the FishHawk Newland Pumpkin Festival and Nativity Catholic’s Novemberfest. It also recently attended a Riverview High School band event with 30 bands and gave back 50 percent of the proceeds to the band department. The pizza trailer is eight-and-a-half feet wide and 18 feet long, with a four-deck pizza oven inside. Items available from the pizza trailer include pizza, Stromboli, calzones, mozzarella sticks and chicken finger. “Basically anything we can bake in the pizza oven,” said owner Manny Tzilvelis, who owns the Italian restaurant in Lithia with Donna Carus, his son, James and Tim Chefalas, who are responsible for the Stein Mart location. On top of the pizza trailer and smart car, Formaggio’s Lithia location at 5622 Lithia Pinecrest Rd. in Lithia (at the corner of Boyette Rd.) will be offering a drive-thru for pizza by the slice or a whole pie from 12 Noon-4 p.m.
For the holidays, Formaggio’s also offers catering, for which orders can be placed at either store with pick-up at the Lithia location and delivery available. For more information on Formaggio’s, please call the Lithia store at 643-1415 or the Valrico store, located at 3474 Lithia Pinecrest Rd., at 681-4939 or visit www.formaggiospizzeria.com. Formaggio’s is also on Facebook at www.facebook.com/pages/Mr-Formaggio/164817570201123.